as well as lots of news from the UK and abroad, reviews of choral and organ CDs, books, concerts, new organ music, new installations, letters, and more. To subscribe, or receive a complimentary copy if you're new to The Organ, visit our subscriptions page. 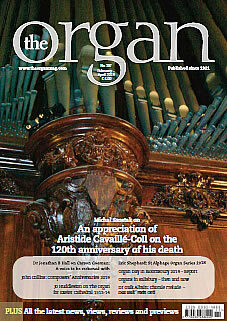 For previous editions of The Organ, see our index of back issues. 2019 marks the 120th anniversary of the death of the father of symphonic organs, Aristide Cavaillé-Coll. 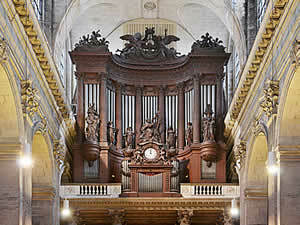 On this occasion, it is worth recalling this monumental figure, who in the 19th- century changed the image of French instruments, and thus influenced organ building in Europe and in many parts of the world, radiating in a unique way to the present day. Reading the source materials about Aristide Cavaillé-Coll (his publications, scientific articles, notes, correspondences, etc), the literature on the subject allows us thoroughly to follow his entire life story. Below, I present a silhouette of Aristide Cavaillé-Coll, first of all as a man, emphasising important moments in his life, which he experienced in parallel with the idea of symphonic organs evolving in his mind. 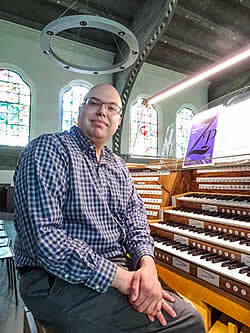 Aristide Cavaillé-Coll came from the family for generations of organ builders with the roots of French and Spanish, which explains his two-part name. His great-grandfather, Gabriel Cavaillé (1699-1745), was a weaver in the village of Tarn. The first organ builder in the family was Gabriel's brother, Joseph Cavaillé (1700-1767), a disciple of the Isnards Brothers, leading his workshop in Toulouse; he built many instruments in the south of France and Catalonia. The grandfather of Aristide, and the son of Gabriel, Jean-Pierre Cavaillé (1743-1809), also an organ builder, married on February 12, 1767, Maria-Francesca Coll, a young woman from Barcelona (daughter of a weaver and producer of canvas). From the marriage of Jean-Pierre Cavaillé and Maria-Francesca Coll, Dominique-Hyacinth Cavaillé-Coll (1771-1862) was born, an organ builder and father of Aristide. Dominique Cavaillé-Coll on April 26, 1810, at the age of 39, married 22-year-old Jeanne Autard (1788-1864), with whom from October 30, 1808 he fathered an illegitimate son, Vincent. Less than a year after his marriage, on February 3, 1811 in Montpellier, southern France, Aristide Cavaillé-Coll was born, a man who revolutionized the French and international organ architecture of the 19th century. To see the whole article, please subscribe to The Organ. The author outlines this cautionary tale of late 18th-century differences between those who make organs and those who play them. In 1794 the organ maker Henry Coster and the organist of St Thomas's Salisbury, Joseph Boyter had an argument in the organ loft of St Thomas's Church, Salisbury. The case was brought before the church courts. This article examines the lives, families and occupations of the two men who were closely connected with Salisbury. Henry Coster trained as an organ maker under Charles Green (a noted Salisbury organ maker) and made organs across the region. Joseph Boyter was the organist of St Thomas's church from 1746 to 1807, making him possibly the longest serving organist in the country. His main occupation was as a woollen draper. He then switched to the hospitality trade and rented The Three Lions Inn on Queen Street in Salisbury. He was a prominent Salisbury figure and was the Clerk of the Course for the Racecourse. He then went bankrupt, but continued his occupation as organist. 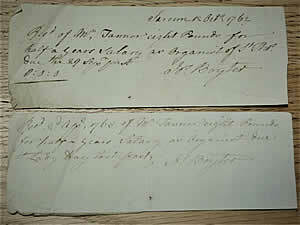 Both he and Coster feature within John Marsh's Journals and had previously been involved in the run-up to two duels. The author examines evidence concerning the vicissitudes of organ-building in England over 500 years ago. Exeter Cathedral's Fabric Roll 2703 and attachment shows that Laurence Playssher was paid "clxiiij.li.xv.s.vij.d" (£164/15/7) for a new organ standing "in pulpito". This overall cost includes 2 payments for new tin, totalling £64/16/2. In contemporaneous terms, this is a very large sum indeed. By way of comparison, in 1438, St Albans Cathedral had spent £51 on a totally new organ, of which the Cathedral was singularly proud; it was said to be the largest organ in England at the time (Andrew Lucas, Organs and Musicians of St Albans Cathedral). Using inflation figures given by Phelps-Brown (in Essays in Economic History, 1962) and Davis (Economic History Review, 2007, 60, 97-136), this sum appromimates to £59 in 1513-14. Similarly, the organs built for churches in Barking (1513) and Coventry (1526) cost a little over £50 and £30 respectively. Each had ranks to suit a compass of 46 notes. The Early English Organ Project interpreted the original records as meaning full-compass open flues at 5ft, 2-1/2ft, and 1-1/4ft, plus a rank of regals. This conclusion is generally felt to be sound, though one could debate the balance between metal and wood pipes and the inclusion of regals. 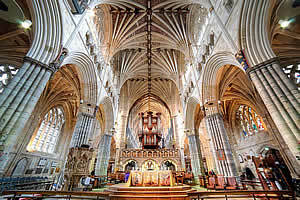 But, like the St Albans costings, these facts do emphasise how large Exeter’s expenditure was. For the next useful cost information we have to wait until the period 1605-1634 (BIOS Reporter XXIV 31-33). Here the costs of numerous supplies consumed in the new organs at King’s College, Norwich Cathedral, and York Minster allow estimates of Dallam family contract prices. I met Carson Cooman by a concatenation of previous encounters. While doing doctoral research on the American organist Calvin Hampton (1938-1984), I met Harry Huff (1952-2016), Hampton's assistant and successor at Calvary Episcopal Church on Gramercy Park in New York City. Huff's career was remarkable, all the more so for his modesty. He worked with renowned musicians and people of culture (including Jessye Norman, Art Garfunkel, and Meredith Monk, inter multa alia). He always seemed to have another important iron in the fire waiting to be revealed in the course of a far-ranging conversation. Eventually Huff was appointed to Harvard University's Divinity School and Memorial Church. (He later left the Memorial Church to become minister of music of Boston's Old South Church; he retained his position at the Divinity School.) It was Huff who first told me about Carson Cooman. He was breathless with excitement, unable to praise the brilliant young man highly enough. Characteristically, his enthusiasm was instantaneous and overt, expressed without any sense of jealousy. I became acquainted with Cooman only later, but his music came onto my proverbial radar screen at that point. To see the whole of this and other articles, please subscribe to The Organ. The ninth Organ Day, 2019, organised by Music in Bloomsbury and Organists Onliine, took place in the familiar surroundings of Bloomsbury Central Baptist Church on Saturday January 26 under the patronage of Dame Gillian Weir, who was present to give a fascinating masterclass for four organists on César Franck’s Second and Third Chorals. The fascination was centred upon Dame Gillian’s profound knowledge of and enthusiasm for these incomparable masterpieces - her comments were both insightful and full of such ease of communication as to hold the least knowledgeable member of the large audience in her thrall. 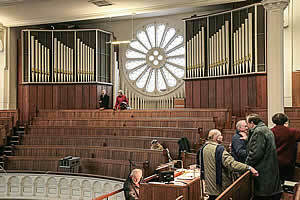 Perhaps the most memorable aspect of Dame Gillian's teachings, to the organists alongside her at the excellent 2008 BC Shepherd instrument – so suitable for this acoustically fine church – as well as her enthralled audience, was her insistence on a little-appreciated aspect of fine organ-playing, indeed of musicianship – phrasing. Time and again, it was Dame Gillian’s explanations and (occasional) practical demonstration of the necessary and expressive qualities of thoughtful musical phrasing that shone new interpretative insights into these works. Her comments were readily taken up by the four gifted organists – George Inscoe, Timothy Patient, Mark Brafield and Michael Whytock – who played for her: lucky musicians, all! Our noted regular contributor presents his annual informative listing of composers of organ music whose anniversaries fall in the coming year. In 2019 there are several composers whose anniversaries can be commemorated, albeit some of the dates are not known for certain; some of the names listed below will need no introduction but there are also quite a few lesser-known names listed here whose compositions are well worth exploring. No claim is made for completion, and there is no guarantee that every edition mentioned is in print – there may well also be editions by other publishers. Websites have been given where known. Details of a few composers whose preserved output consists of only one or two pieces have been omitted. 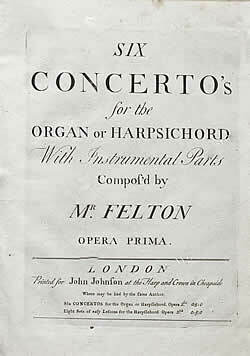 William Felton 1715-69 Vicar choral at Hereford cathedral and amateur composer, he left 32 concerti for organ or harpsichord based on Handel’s in five sets of six opp 1, 2, 4, 5 and 7 (the latter set was reissued with eight concerti) and two sets of Eight Lessons for the harpsichord opp. 3 and 6. The keyboard part for the six concerti in Op. 1 has been edited by Greg Lewin as OM131 and published by himself.